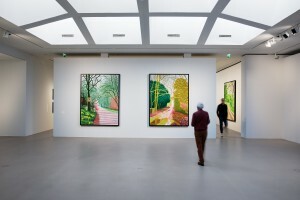 David Hockney was born in 1937 in Bradford, England, and he lives and works in Los Angeles. Although closely associated with the emergence of Pop Art in the 1960s, he nevertheless rejects art-historical labels and pursues a wide-ranging artistic practice based on multiplicity and innovation. 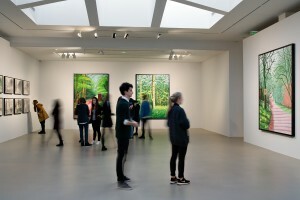 He is one of the leading and most enduringly popular figures in contemporary art. 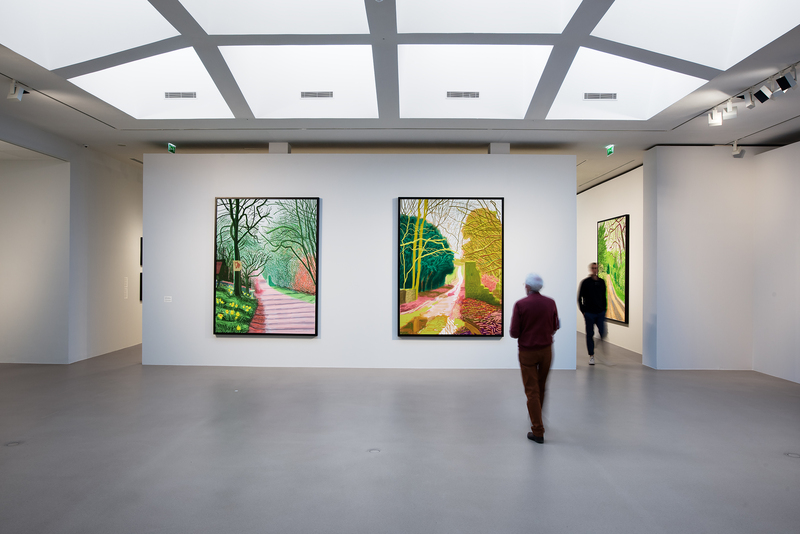 For a long time David Hockney divided his time between the US and Great Britain, and more specifically between Los Angeles, where he has lived most recently since 2013, and his native Yorkshire, whose wooded countryside provides the motifs of the two series on show at the Fondation Vincent van Gogh Arles: The Arrival of Spring in Woldgate, East Yorkshire in 2011 (twenty eleven), comprising 12 large-format inkjet prints from drawings that Hockney created on his iPad, and Woldgate, The Arrival of Spring in 2013 (twenty thirteen), a set of 25 charcoal drawings on paper, presented here in five groups of five views. These two series testify to the artist’s unflagging curiosity for new picture-making techniques and technologies, and about how he can use them to renew the language of art. Since first moving to Los Angeles in 1963, he has worked in widely differing genres. 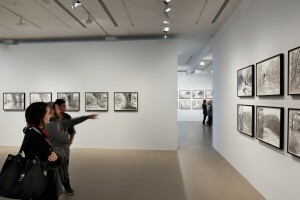 The oil paintings, and subsequently acrylics, that established his early fame were followed by stage designs for the opera (as from 1975), his highly-regarded photo collages in the 1980s, which were created on the basis of Polaroid instant snapshots, and since 2009 his drawings made with art apps on the iPhone and the iPad. 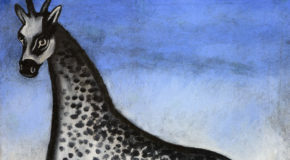 Both the iPad and the charcoal series of drawings were produced outdoors in the East Yorkshire countryside, which the artist observed attentively as winter gave way to spring. 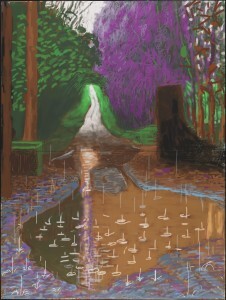 Working with the touch-screen tablet, which Hockney uses as a digital sketchpad, allows the artist to explore a new visual language while at the same time affirming his love for colours, here taken to their most luminous heights: “I don’t know how I see colour, but I see it, and I like it. I suppose I exaggerate it a bit 1”. 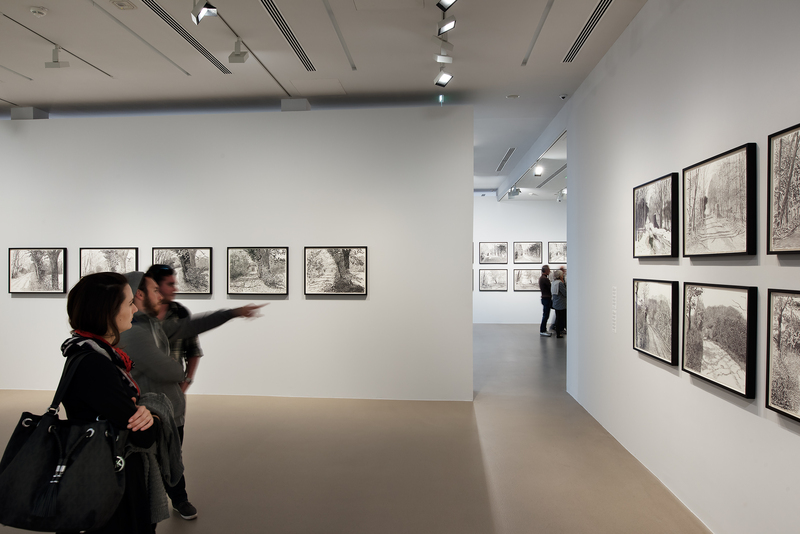 The charcoal drawings simultaneously invoke Hockney’s fascination for Chinese scrolls, which inspire in him the idea that black and white contain colours, as well as with the compositional changes in the Woldgate landscape over time – an exercise in patience to which he had to subscribe to in order to paint the same view on five different occasions. 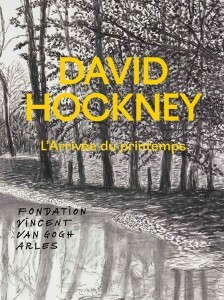 The exhibition David Hockney: “The Arrival of Spring” is complemented by other works by the artist, including Vincent, Chair and Pipe of 1988. This painting, with its vibrant colours and inverted perspectives, testifies to Hockney’s admiration for Vincent van Gogh, who, a century earlier, was already using non-imitative colours to transmit his vision of reality. 1 David Hockney in an interview with Martin Bailey, 22 May 2015, published in our exhibition catalogue.